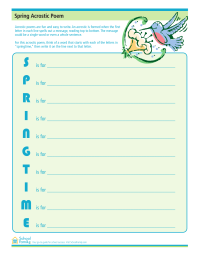 Celebrate Spring with this acrostic poem activity. Think of a word or phrase that starts with each letter of the word "springtime." 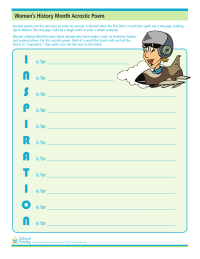 Celebrate Women's History Month with this acrostic poem activity. Think of a word or phrase that starts with each letter of the word "inspiration." 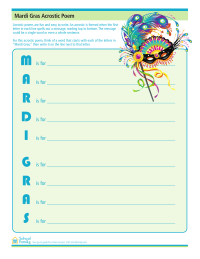 Celebrate Mardi Gras with this acrostic poem activity. Think of a word or phrase that starts with each letter of the words "Mardi Gras." Celebrate St. Patrick's Day with this acrostic poem activity. 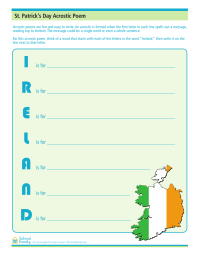 Think of a word or phrase that starts with each letter of the word "Ireland." 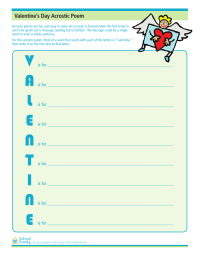 Celebrate Valentine's Day with this acrostic poem activity. Think of a word or phrase that starts with each letter of the word "valentine." 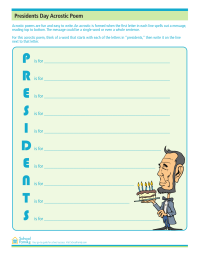 Celebrate Presidents Day with this acrostic poem activity. Think of a word or phrase that starts with each letter of the word "president." 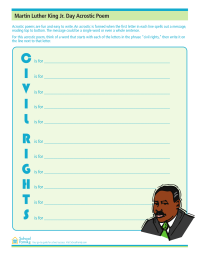 Celebrate Martin Luther King's birthday by writing an acrostic poem worksheet using the words "civil rights." 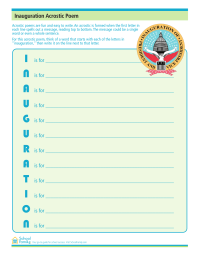 Celebrate the inauguration with this acrostic poem activity. Think of a word or phrase that starts with each letter of the word "inauguration." Prosperity is a main theme in the celebration of Chinese New Year. 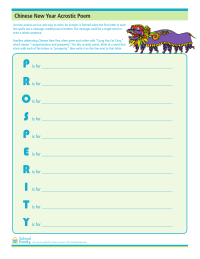 In this acrostic, think of a word or phrase that starts with the letters in the word "prosperity." 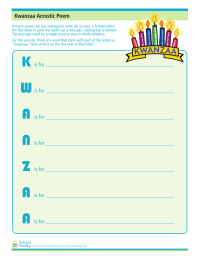 For this acrostic, think of a word that starts with each of the letters in "Kwanzaa," then write it on the line next to the letters. For this acrostic, think of a word that starts with each of the letters in "Hanukkah," then write it on the line next to the letters. 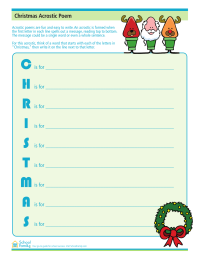 For this acrostic, think of a word that starts with each of the letters in "Christmas," then write it on the line next to the letters. 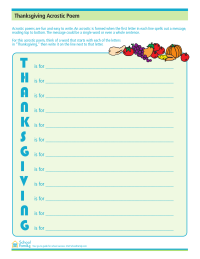 For this acrostic poem, think of a word that starts with each of the letters in “Thanksgiving,” then write it on the line next to that letter. 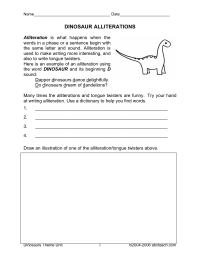 Learn about allusions, similes, and acrostics with this dinosaur poetry, provided by ABCTeach.